It’s technically Pi Day, but pie certainly plays into the enthusiasm. Every circle, no matter if it’s a pea or a planet, has the same circumference-diameter ratio. That ratio is pi. It’s also a number. One that’s not easy to quantify. Its digits go on and on and on—forever. Pi has some interesting real-world applications: sound waves, global navigation, even rainbows have connections to pi. Most people say pi equals about 3.14. That’s why Pi Day is celebrated by math geeks around the world on the March 14. This year is especially exciting because it’s Pi Day to the fourth decimal point: 3.1415. That won’t happen again for a hundred years. In 2009, the U.S. House of Representatives jumped onto the math party wagon and issued House Resolution 224, designating March 14 as Pi Day. Amid a dozen whereases was concern that American students were lagging behind in math and science compared to kids in other countries. Lots of math teachers didn’t need a House resolution to get their kids excited about math. That’s true for Mara Lewis, who teaches 7th grade math at Catalyst Maria charter school in Chicago. She remembers celebrating Pi Day when she was a kid. Sofia Salazar, one of Lewis’ students, is catching on. There’s no real connection between mathematical pi and food pie, and math teachers aren’t the only ones buying into the fun. Paula Haney runs Hoosier Mama pie shop. 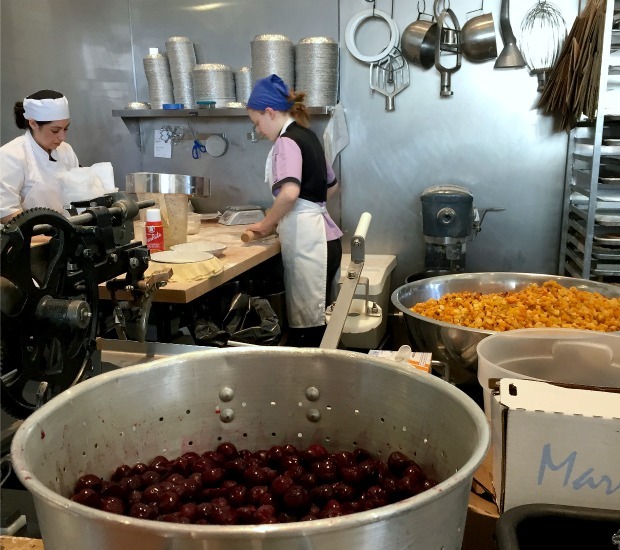 As she slices and squeezes tiny key limes, she says she and her husband opened their first pie shop on March 14, 2009, the first unofficial official Pi Day. Since then, they’ve learned just what a big deal Pi Day is. Last year, their shop in Evanston exceeded expectations. Haney says on a typical Saturday, she makes about 170 pies. This year, she’s prepping for more than 400. All the attention may be igniting enthusiasm among students, but so far, Pi Day hasn’t done much to change how American kids rank in math compared to the rest of the world. But teacher Mara Lewis thinks it’s fun to keep trying. And after all, Pi Day is really about making math as delicious as possible.